I have been an active part of the blogging community for a while now and as bloggers know you read as many blogs as you post, especially on link-up features (which I love!). Over the last year I have noticed a trend in the blogs I read and those I open and close immediately and I wanted to share what turns me off reading a blog and may be turning your readers away. I know that they are an income for many bloggers and help with running costs, but please keep it to a minimum and if possible not flashing or moving. Maybe it's because I suffer motion sickness but I find them so distracting. 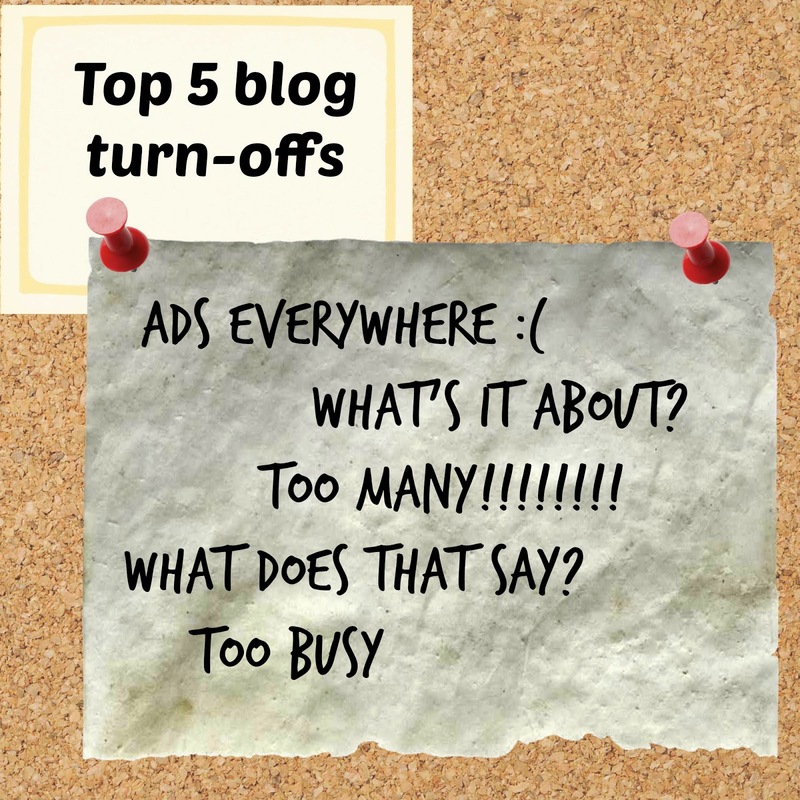 I have come across some blogs where the adverts are down the side, at the top and bottom of blog posts and the worst, in the middle of a post! I want to focus on what you are sharing, not on what someone is selling. Keep it simple. I like my writing clear, well laid out and easy to read. I want to open it and just read, I don't want to be increasing my screen size to be able to read small text or trying to decipher curly writing. This seems like an obvious point but I am amazed by the amount of articles I open up that I can barely read or are so squished together it makes reading hard work. Be bold and don't be afraid of white space. You have taken time and thought to write and I want to read it. It is tempting to try and cover as many topics, ideas and trends as possible to increase your traffic but know what you're about. A focused blog makes an impact, I love to see your passion right there on the front page. A sub heading is a great way to sum up your passion and what I can expect as I read. Keep the links clear, I want to find my way around easily and read all you've got to offer. I love that you're excited and want to make a point but use words not exclamation marks. One or two here and there of course, but I am surprised when I find articles with handfuls at the end of every sentence. An exclamation mark highlights your strong feelings about something, explain your feelings, tell me about it - don't leave me assuming with exclamation marks. These are just a couple my bug bears when I'm hopping around the blogs - maybe there's something I've missed that makes you click straight out? Why not share in the comments below. I so appreciated this list, thank you. I am resisting using some exclamation points here. :) Stopping by from Coffee for Your Heart. My pet hate is very dark backgrounds and a white typeface. I find it very hard to read and therefore give up even if the content looks good. Too many exclamation marks exhaust me. This is a great list. I've had that white space issue on my mind and been procrastinating on how to change the font size/spacing in my theme. Thanks for the good reminder to take care of that detail. So happy to visit today from Tell His Story and to make a new bloggy friend. I've added my very favourite, Postcards from Heaven. The idea is so original, and the posts so well-written and concise! I did try to add my own, but for some reason all the photos are gone from it. I'm writing for Families First blog at the moment anyway, so not updating so often. What a great list of things to look out for! I find it disconcerting when every blog post includes a ginormous list of buttons to which a blogger links up with that I have to scroll through to find the comment section ;). I know that with WordPress and the Jetpack plug in, it's possible to control which button shows up according to which link up a person is linking up to. It took me about an hour, but I figured it out and I'm so glad that I did! Like you, I understand many wonderful bloggers are able to stay home and be wives and moms because of their blogging income, but it is distracting when there is too much. Thanks for a great post and for linking up on Mondays @ Soul Survival. happy to add a fav blog onto the list - and lovely idea - Thankyou.